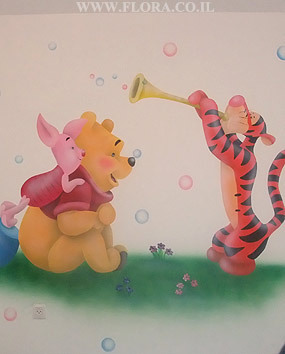 FLORA - MURALS - KIDS ROOMS - WINNIE-THE-POOH ROOMS - WINNIE-THE-POOH, PIGLET AND TIGER WITH FLUTE. Winnie-the-Pooh, piglet and Tiger with flute. The mural in the room of babies. Tiger playing on the flute. Po and piglet are attentive. Location: Tel-Aviv. Muralist: Flora.